record pace but was unable to catch his flying compatriot, starting the race from second position on the grid ahead of Dani Pedrosa in third. Lorenzo had a near perfect session this morning, as the sun shone down on the circuit he was able to bring lap times down from Friday’s pace as well as pull a half second lead over Marquez. Although it’s the Brits who were the talking point in free practise three as Redding, Smith and Crutchlow all secured automatic positions in qualifying two in front of their home crowd. Just one second covered the top 10 and times were getting close to record breaking pace. 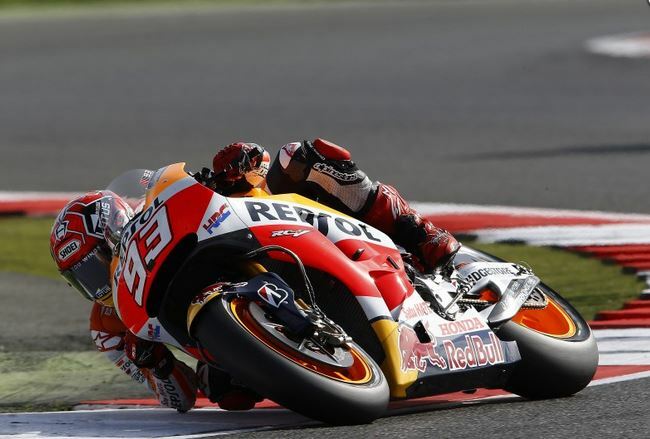 Dovizioso was half a second back from Lorenzo in third, as Pedrosa finished in fourth. Free practice four saw Marquez finish on top ahead of Iannone and Pedrosa, with Lorenzo down in fourth position, almost a second off his compatriot’s time. Hector Barbera crashed out with 20 minutes of the session to go but rejoined. Rossi used the session to set a series of lap times but could still only manage seventh position 1.086s, as Bradley Smith was top Brit in 9th. An error from the Suzuki Ecstar team Aleix Espargaro was sitting fastest throughout the majority of qualifying one, only to be pushed out of the top spot by Yonny Hernandez in the closing minutes. Marquez headed out in qualifying two as soon as the green flags were waved and he broke his lap record on his opening lap, with a time of 2.00.564. Rounding out the front row is Dani Pedrosa, who was pleased with his pace at a track he seems to struggle with pace early on: “At this track where I always don’t go that well, it was good to get a front row start. In the past few years I’ve always been further back and then on the Sunday I’d loose so much time in the race start so it was important and I have a good lap on the tyre. I was working a lot to improve my rhythm for FP4, I was also using the tyres from the morning so I get some improvements, which I was happy to see. Championship contender Rossi improved in the closing minutes of the session to secure fourth position on the grid, but knows a podium will be a hard ask tomorrow “I’m quite satisfied about today because we are able to improve a lot the feeling and the setting of the bike. We try a lot of things and at the end this afternoon was not so bad. I think the podium will be hard because Pedrosa has a very good pace so we need to continue and try to make a bit better tomorrow. The target was to start on the second row and I am on the front of the second row that is also better. I was able to do 2.00 like the top three guys and 2.00 is very good here in Silverstone because I think I arrive quite well, I pick my lap time at the right moment and starting in the fourth position is good for tomorrow. Now we have to wait for the weather conditions and to try to see what’s happen tomorrow and I hope for good weather for a dry race.